HERE'S the proof that bad weather never stops play in Ireland. 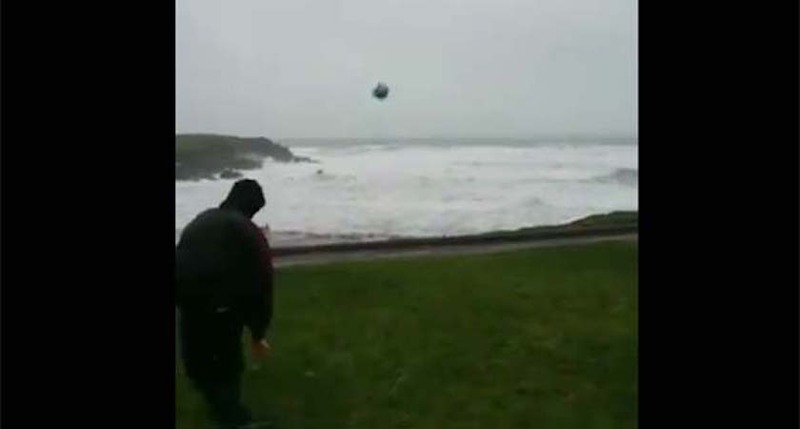 While most people wouldn't dream of going outside in the middle of a storm, this Irish footballer couldn't resist a kickabout in the wind and rain. The wrath of Storm Eleanor didn't seem to bother Kildare Senior footballer Eanna O'Connor as he took aim out to sea. The storm left around 55,000 homes and businesses in Ireland without power last week after winds of up to 155km/h and coastal flooding caused chaos across the country. The areas worst affected included counties Galway, Mayo, Sligo, Leitrim, Cavan and Monaghan. The video was filmed by Eanna's brother Cian in St Finan's Bay in Ballinskelligs, Co. Kerry. The pair, originally from Kerry, now play with Kildare club Moorfield. The brilliant video, shared online by Martyn Rosney, has now been viewed over two million times and has over 37,000 likes.